“’Jellygirl approaches games lessons with enthusiasm’,” reads ActorLaddie. I am weeding the file labelled ‘instruction booklets’ and look up to find that he is holding one of my old school reports. “So, still rubbish. Unlike you Borders types.” I now have started weeding the folder which contains memorabilia of sporting achievements. There’s a photo of GrannyBorders, all lean and long legged, with the cup she won for being the county athletics champion. Her best friend, Lily, told us that other schools dreaded playing hockey against Melrose Secondary because with GrannieBorders bullying off, no other team stood a chance of winning. There are certificates for ActorLaddie who ran at county level. And my yellow ribbon for swimming a width. I was always a complete disaster at anything sporty. For one thing, I am smaller than the average gelatine-based female; and for another I have these weird eyes – one long-sighted and one short-sighted – which is my excuse for not being able to throw, catch or hit things. I could manage other bits of PE at primary school – forward rolls, folk-dancing and the like – but nothing which involved speed. My finest moment came in an obstacle race when I was nine, when the teacher setting out the course had seriously misjudged the size of the horizontal ladder. I slipped between the rungs and came in a comfortable first while the other girls were still trying to free themselves. With such a proud sporting background, it was a matter of some astonishment to most of my family when, last spring, I took up jogging. I’d been feeling wearier and lower than usual for some time and it occurred to me that perhaps I wasn’t getting enough physical exercise. I’d read an article in the Guardian by Charlie Brooker who had taken up running having downloaded an NHS podcast called ‘Couch to 5K’. He claimed it was fool-proof. He was right. It was while jogging around the park, exactly a year ago, that I became aware of a bit of a tremor in my right hand which I decided at the time was due to the exertions of the exercise. But that’s another story. Fast forward to last autumn. 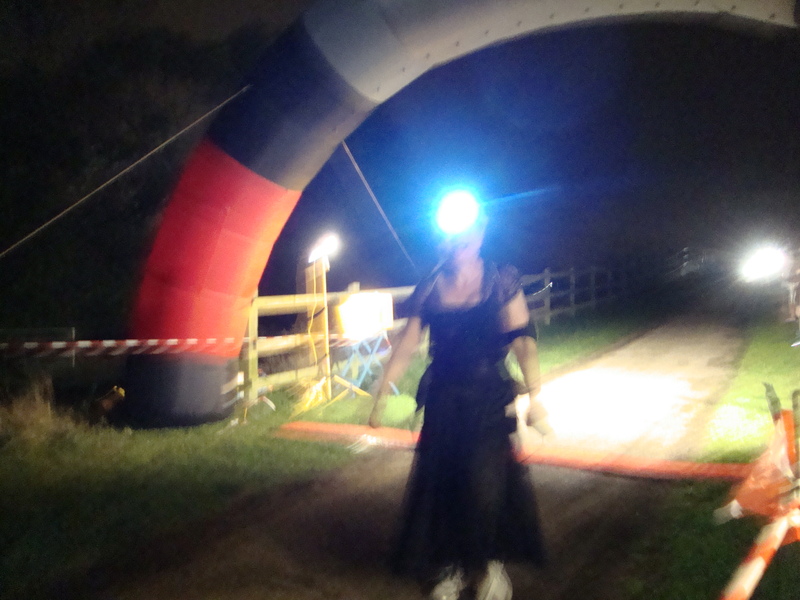 I saw an advert for the Spooky Sprint: a 5K Halloween-themed night-time sponsored run through the woods of the Lea Valley Country Park being organised for Parkinson’s UK. In a rush of blood to the head, I signed up and bullied ActorLaddie and Bro-in-law to join me. I had at that point not actually run 5k and had never taken part in a ‘fun-run.’ By the time we hit the start line, however, £2,000 of sponsorship money was riding on us finishing. Running in the dark, behind the other proper runners but in front of those who hadn’t done any training and started walking once out of sight of the supporters, was an extraordinary experience and crossing the finish line was a very proud moment. Thank you, Laura. There has been discussion recently as to the appropriateness of people raising money for PUK by sponsored action-based activities: running, sky-diving and the rest. For people further down the Parkie road than I am, simple everyday actions can be a struggle, and some feel that these sporting events are just rubbing salt into the wounds. I can see why folk might feel frustrated but frankly, I feel grateful for anyone raising money for PUK as that is going to bring a cure even closer. I am still bartering with my condition: if I do my best to keep fit, then perhaps a cure will get to me before the symptoms really kick in. So I am very grateful for anyone who is doing their bit to make this happen by running the Marathon tomorrow, particularly after the dreadful events in Boston. Laura and I will be with you every step of the way and may all the ladders on the route be easy to pass through. A friend has justed texted to tell me that her school report said she had “a limited movement vocabulary”. Brilliant! Any other euphamisms out there? I think not being able to throw, catch or hit a ball might be in genes – I’m the same! Couch to 5K is not foolproof! I stopped doing it for no reason whatsoever! Try again, YL. It’s easier in the spring! My husbands got parkinsons and we ran the London marathon together in just under 6 hours to raise money for Parkinson’s UK. We jog in the lea valley park, and there’s a new club “Lea Valley Joggers” who meet at the Wharf Road car park in Wormley if you want some company. Keep jogging Jellygirl, there’s nothing quite like it to lift your spirits! Blooming ‘eck, Sheryl, that’s brilliant. Well done to the two of you! Is sponsorship still open? Can I be cheeky and ask how old your husband is?